Two race recaps in one week. I'm on a roll. 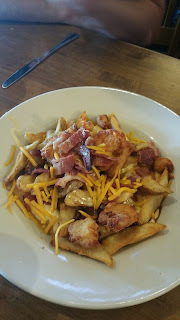 This afternoon we leave for a short trip to the Tennessee Smoky mountains with Matt's family so any additional blogging is not likely to happen. A little over a month ago, Kelly mentioned she was buying a bib for the Door County Half Ironman on Sunday, July 19. 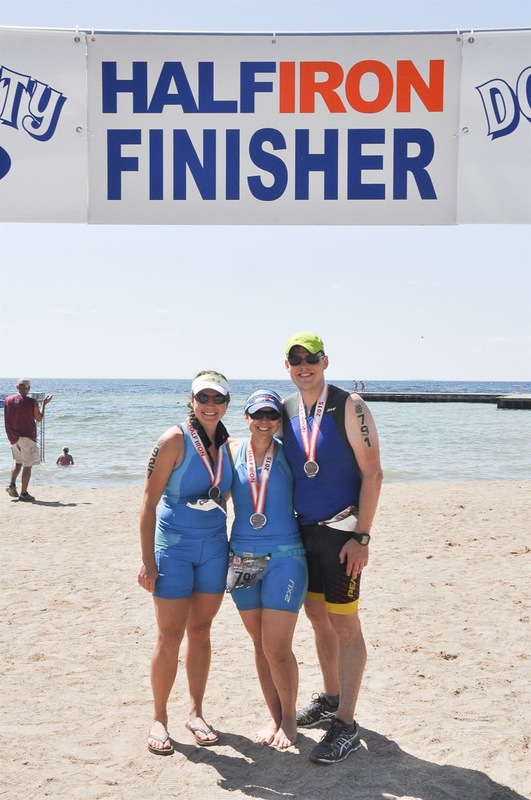 The Door County Triathlon allows participants to transfer their registrations if they aren't planning on racing and quite a few people were trying to sell their entry. So on the last day that transfers are allowed I bought a bib for $100 plus the $20 transfer fee! That's a good price for a half Ironman in my book! I was already planning a half Ironman double in August--racing Ironman Steelhead 70.3 on the 9th and Pigman a week later on the 16th. So I wasn't really feeling ready to tackle a half Ironman quite so early but I figured I could use the race as a long training day. Kelly found us a super cheap campground less than 10 minutes from the race site. Matt and I headed up late Saturday morning but not before stopping at Cabela's to purchase an air mattress! I need to camp in style! 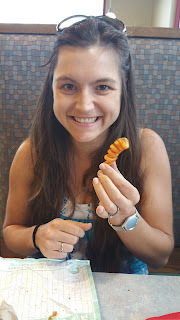 Choosing the healthy route before a race is always important, so it makes total sense that we chose Arby's for lunch. I'm a sucker for curly fries. 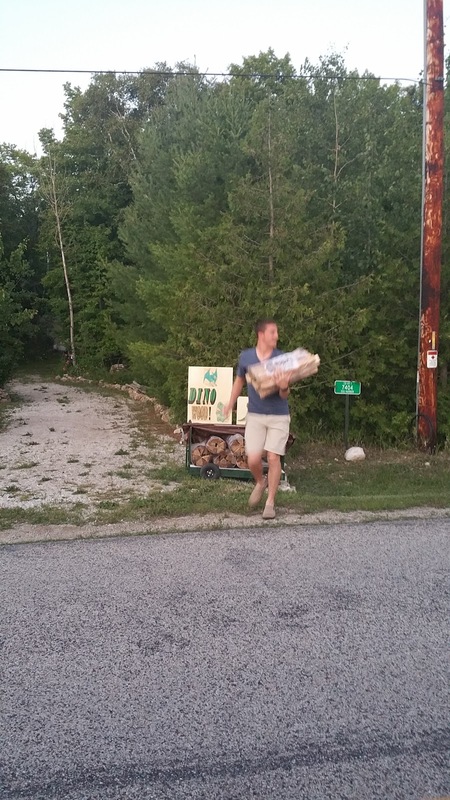 Door County offers day of packet pickup so we didn't worry about rushing to the race expo that night. Kelly was already at the campground so once we arrived we got our air mattress set up and enjoyed a Spotted Cow before dinner. When in Wisconsin, right? 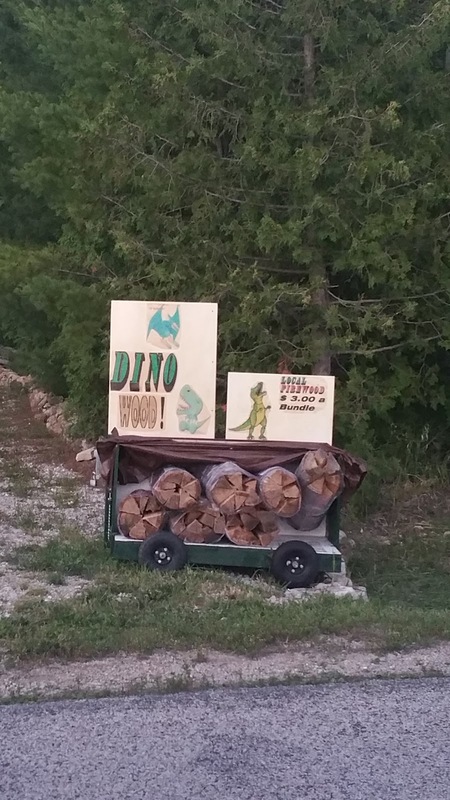 After a scenic dinner in Egg Harbor, we picked up some DINO wood before building our campfire to make some s'mores before calling it an early night. Thankfully the weather cooled off nicely and I got a fairly good nights sleep. Matt, however, was convinced he wouldn't need any blankets due to the heat and ended up stealing my one blanket halfway through the night. How rude! 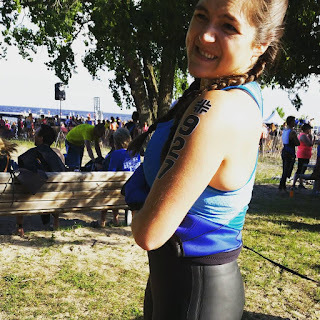 The birds woke us up before our alarms on race morning so I made use of the quarter showers to rinse off the bug spray before donning my blue race kit. Breakfast was a bagel and peanut butter provided by Kelly because I did not come prepared. Getting to the race site, packet pick-up, and tattoo application all went smoothly and soon I was racking my bike in transition. Race numbers were assigned at packet pickup so I was #927 and that netted me a pretty good location in transition. After making a quick note of where swim in, bike out, and run out locations were, Matt and I headed over towards the swim start. 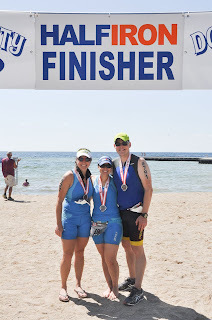 Thankfully Kelly and Brent found us before my swim start. The bay had 18 inch rollers which made it the choppiest water I had ever swam in. When the gun went off for my wave, I told myself the worst part would just be swimming out and once I was swimming parallel to the shore it wouldn't be so bad. That turned out not to be entirely true but it helped get me through the swim. The race had A LOT of lifeguards out in the water which I was very thankful for! As I was approaching the second turn buoy I got really confused as two turn buoys were very close together and I was unsure if I was supposed to go through them or what. A lifeguard ended up bumping me with his floaty and telling me I needed to go around both! I fully admit fault here because I did not look at the provided course videos which would probably have cleared up the confusion for me. The chop in the swim meant I swam not straight at all. And at times I would look up to sight and only see a swell of water in front of me and no buoys. I never felt panicked or out of control swimming but I was glad to be getting out of the water. The swells definitely affected my swim time and I am fairly certain I hit a personal worst swim time. Yippee! T1 went quickly thanks to a great wetsuit stripper! Bike mounting went smoothly and I was off for 56 miles. I spent the first few miles settling my heart rate down and rehydrating. The bike course was very scenic and most of the roads were in good condition. I enjoyed not having to make any 180 degree turns. Aid stations offered water and Gatorade endurance formula which I took advantage of because the weather was warm and getting warmer. 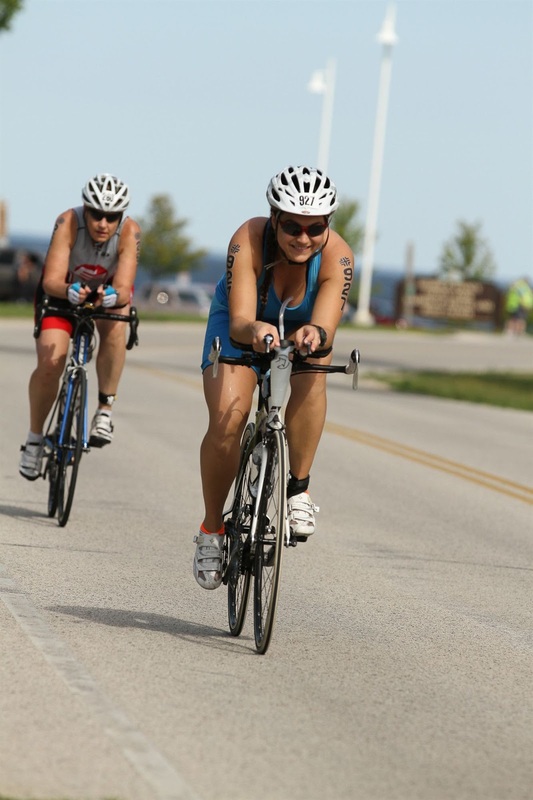 My goal on the bike was to stay comfortable and set myself up for a strong run. Rumors swirling around before the race indicated that it was a hilly course and though there were a few rollers I wouldn't consider this course hilly. I never had to get out of the saddle to climb. Near the end of the bike I started getting a headache and figured I wasn't taking in enough water and salts so I chugged a bottle of Gatorade. By the end of the bike my headache was gone! On the bike I ate one BonkBreaker bar, one Honey Stinger waffle, and one Clif Shot Gel plus a few bottles of water and maybe 2 bottles of Gatorade. 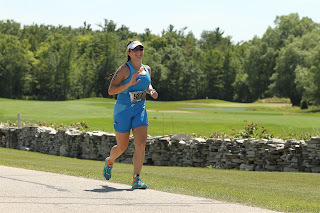 T2 was another fast transition into my running shoes and visor. I forgot my race belt so I had to pin my bib to my top. I won't forget my race belt in the future. Once I started running, Matt pedaled up to me on his bike and told me that I was doing so good (I told him that I did not expect to do well!) to which I replied that I still had a half marathon to run! Running intervals worked well for me during the Ironman and I decided I would run 1 mile then walk for 30 seconds plus I walked through all the aid stations and up the steep hill at 5.5 and 9.5. This method worked out great and I was able to keep even pacing through the end of the race! Making it my best and fastest half Ironman run yet! At each of the aid stations I would take a cup of water, drink a few sips and dump the rest over my head, chug a cup of Gatorade, and dump ice down my top and my shorts. Yes it is weird to dump ice down your shorts but it really helps me to stay cool. I never felt too hot during the run! On the run I ate a Gu and a packet of Gu Chomps. The hill at 9.5 was steep and it slowed my pace down a lot but there was no way I was running up that thing! My heart rate was high just walking! The popsicle aid station around mile 11 was clutch! The finish is down a big hill so I picked up the speed as much as I could but my quads were burning. I came flying into the finish! Immediately after the finish there were dunk tanks with cold water which I happily climbed in to cool off. Then I got my medal and found Matt while we waited for Kelly and Brent to finish. Having Kelly and Brent chasing me all day was great motivation to keep running! I am thrilled with my finish. Matt mentioned how stoic I was before the race and how he knew I was really nervous. And I was! 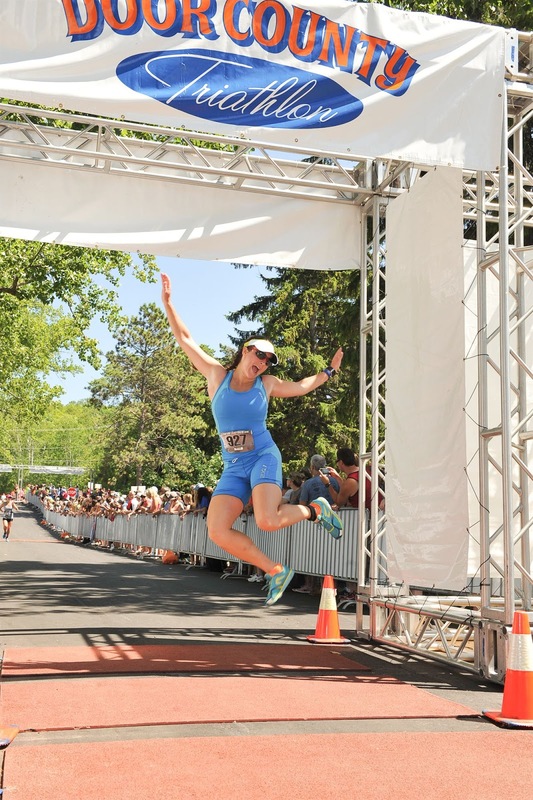 I felt very undertrained for this race but I think not having a time goal actually helped me relax and race smart. The post race meal included BBQ pork sandwich, an ear of corn, and 2 beers! Spectacular post-race food in my book. We hung around for a bit but the sun was hot and I could already feel the sunburn on my shoulders. Plus with the long drive home we wanted to get started earlier rather than later. 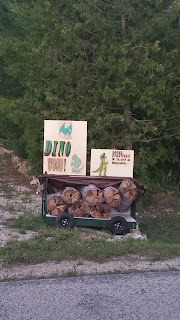 After another quarter shower at the campground, we packed up our stuff and headed home. 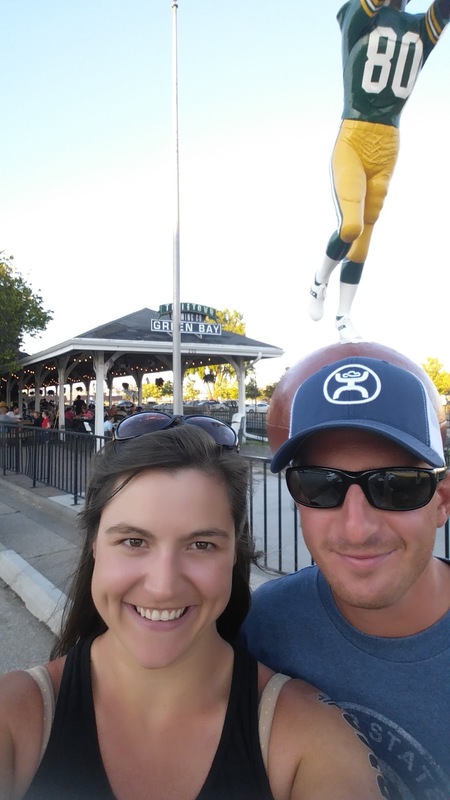 Half Ironmans make me famished so we stopped for dinner at Titletown Brewing in Green Bay. I enjoyed a cold Kurty's Hop Monster which was basically named after me and destroyed a spicy elk burger. I couldn't resist taking a selfie with the Donald Driver statue outside! Would I do it again? Definitely! The cost is great and I thought everything was well managed. Next year we want to stay for the tiki party on the beach!